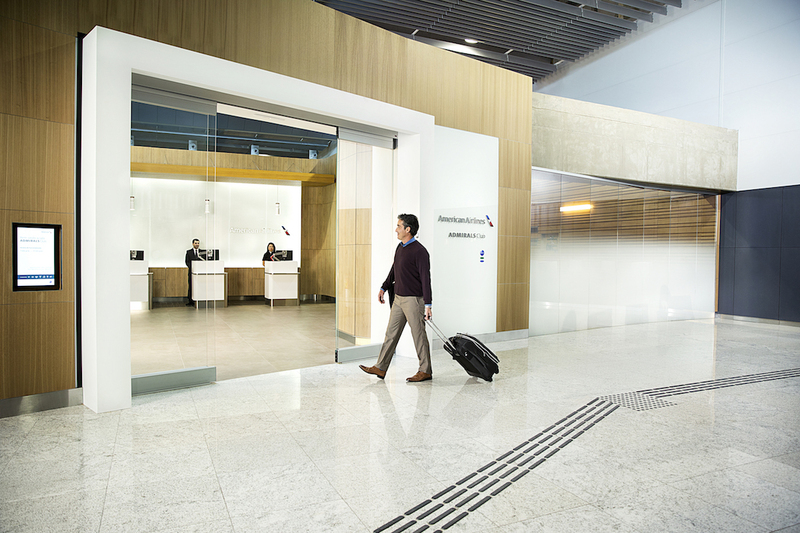 American Airlines Business Extra is a business travel incentive program designed for small and mid-sized companies to help reduce travel spend. What is American Airlines Business Extra? 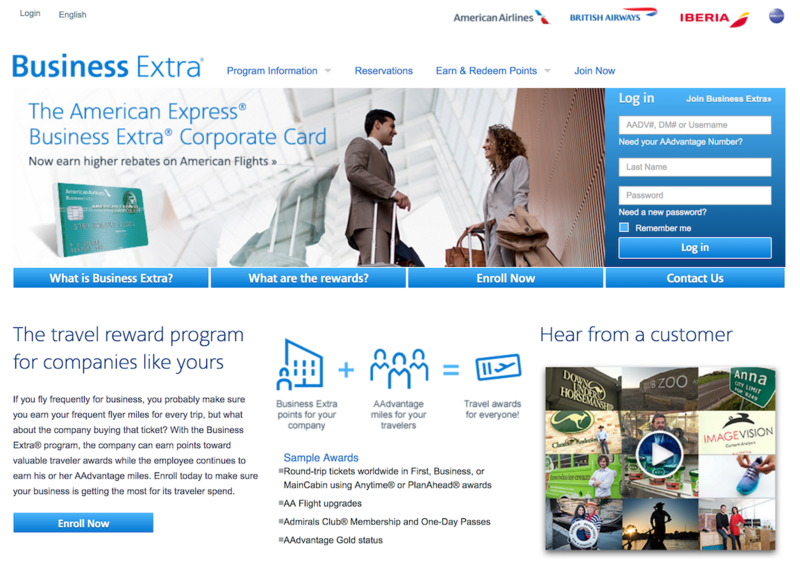 Business Extra (previously Business ExtrAA) is the corporate travel program of American Airlines where companies can register and earn points on employee travel (on top of the employee earning miles too). This is what’s known as "double dipping" on points because for the same amount of travel, you can earn points in 2 different ways. Companies accumulate these points and can then use them to redeem flights, upgrades, airline status and club/lounge access. Business Extra is also the small business program for British Airways and Iberia. The program targets small to mid-sized companies but you don’t need a tax ID (EIN) to register. The program is currently only valid for companies located in the United States, Canada, Anguilla, Bahamas, British Virgin Islands, Dominica, St. Kitts/Nevis, St. Lucia or St. Vincent. For companies based in the UK and Europe, American Airlines, British Airways and Iberia have a separate On Business programme. What is the difference between Business Extra points and AAdvantage miles? Business Extra points are for companies, AAdvantage miles are for travelers (individuals). For every flight, a traveler can earn AAdvantage miles for themselves as well as earn Business Extra points for their company. How do I earn Business Extra points? Companies earn 1 Business Extra point for every $5 spent. You can earn Business Extra points for tickets marketed by American Airlines, British Airways and Iberia, this includes flights operated by those 3 airlines as well as their partner airlines, Qantas, Finnair and Japan Airlines. Marketed, operated and ticketed are very different terms when it comes to earning points. To earn Business Extra points on Qantas, Finnair or Japan Airlines flights, you have to book it as a codeshare and it must be ticketed on American Airlines ticket stock (your e-ticket will start with 001). This is a crucial point as tickets issued on British Airways stock (125) or Iberia ticket stock (075) are not eligible for Business Extra points. 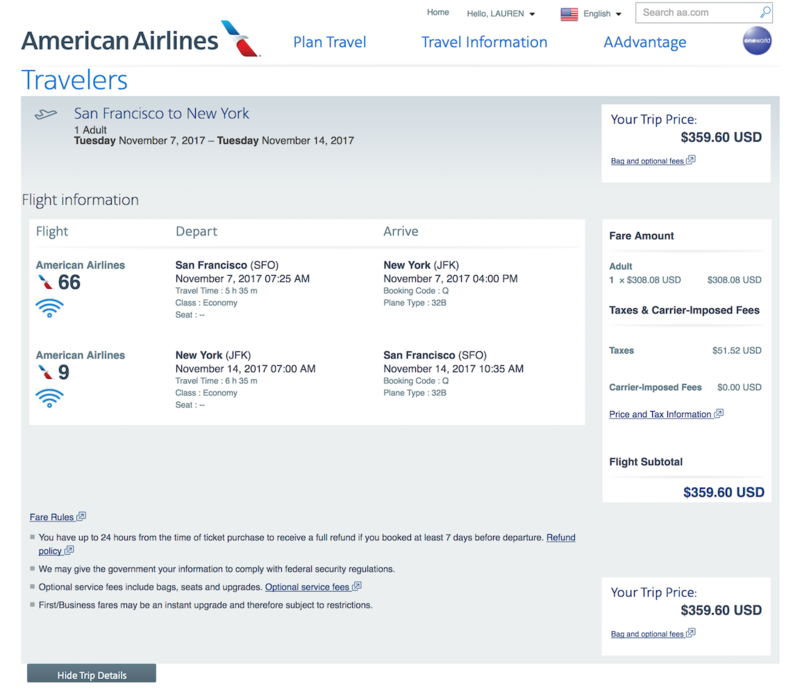 For example, you need to book a round-trip flight from San Francisco (SFO) to New York (JFK) in November. You would pay $360 for an Economy seat with the booking code Q. This $360 price includes $52 in government taxes which is excluded when you’re calculating how many miles and points you earn. We work from the base fare of $308 instead. This would earn you 1,540 AAdvantage miles as the traveler and 62 Business Extra points for your company. 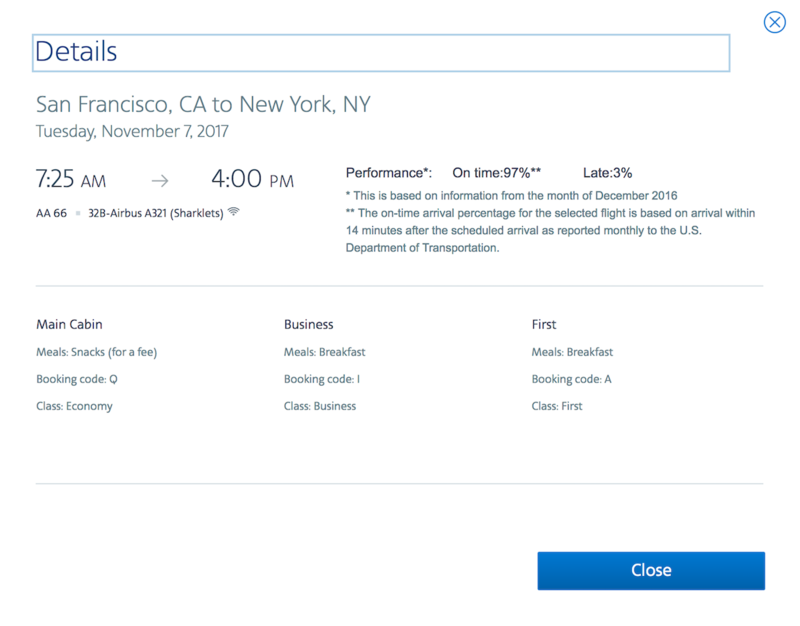 If you paid for Business class in booking code I for $1,317 (base fare of $1,198), you would earn 5,990 AAdvantage miles and 240 Business Extra points. If your company books 2x round-trip fares of roughly $350 a month, you’ll earn ~1,500 Business Extra points in a year. Although you don’t earn as many Business Extra points compared to AAdvantage miles, you need fewer of the points as opposed to miles to redeem the same reward. As a bonus, the Business Extra program is celebrating "20 years in the making" in 2017 and will have bonus offers throughout the year. Currently, they're offering 650 bonus points for any new companies regsitering and current companies, all you have to do is register here for the promotion before March 31 and fly within 30 days. How can I use Business Extra points? The amount of points you need to redeem an award varies from 300 points (a BXP7 award code), which will get you a day pass into all American Airlines airport lounges (Admirals Club) to 25,000 points for a First class Anytime round-trip ticket (BX5F, BX6F, BX7F and BX8F award code) from the US to Europe, Asia, South America or the South Pacific. Business Extra points can be used for flights and upgrades, however it’s not as simple as finding a flight you want, then clicking to book with your Business Extra points, unfortunately. There’s a more laborious process to it: you need to check that the flight you want is available to be redeemed with an award, redeem your points for the correct award certificate, then call American Airlines to use the certificate on the flight you want. Let’s keep the SFO-JFK round-trip example. It takes 2,000 Busines Extra points to redeem this trip as a PlanAhead Award (with the BXTA award code). The PlanAhead award means they are subject to special limitations on seat availability and may be subject to travel embargo dates. 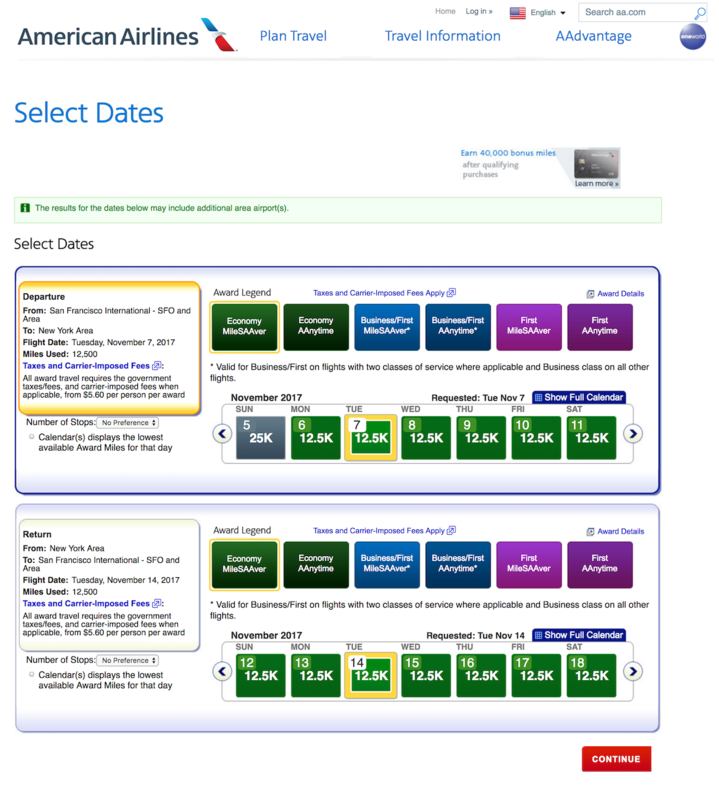 You can view the availability on the AA site by selecting “Use award miles”, and searching the MileSAAver options (this shows award booking codes T for Economy, U for Business and Z for First). Note that this will show you how many AAdvantage miles it will take to redeem the flight, not how many Business Extra points. For an Economy seat, it will be 2,000 Business Extra points to redeem vs. 25,000 AAdvantage miles. You can view all the Business Extra Awards and how many points you need for each here. For flight awards, you first redeem your points for an award certificate, this will be sent by email with your Electronic Authorization Number. You then need to call American Airlines Meeting Services on 1-800-433-1790 to reserve the particular flight/s you want. For upgrade awards however, your award certificate will arrive by paper snail mail, you can still redeem the award though once your flight is ticketed, but you must bring the original paper certificate to the airport to be able to check in. Upgrades get even more tricky, you not only have to find available award space in Business or First class (booking codes C for Business and A for First), but you also have to book a certain Economy fare class for it to be eligible to upgrade (the upgrade award excludes booking codes B, N, O, Q and S). 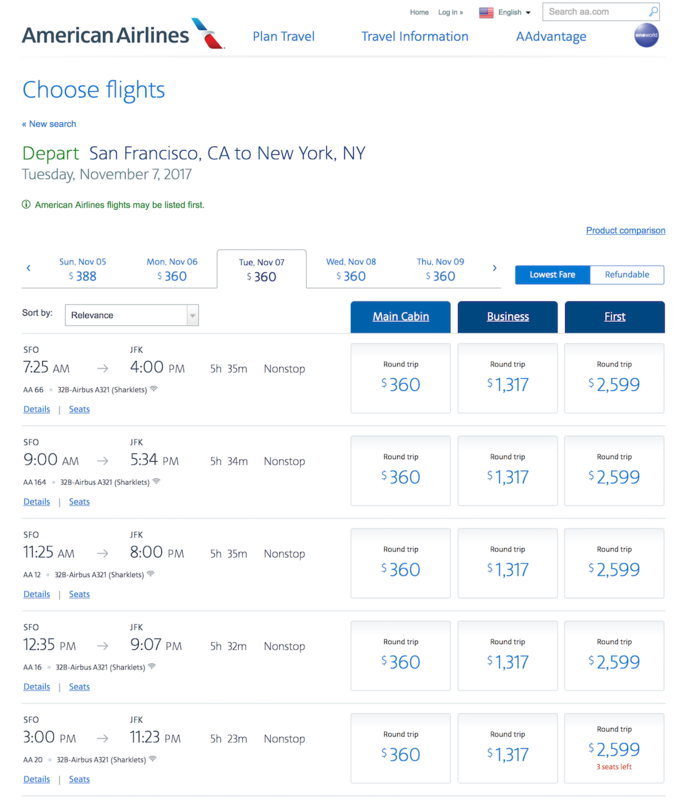 In the example above, the $360 Economy fare for SFO-JFK is in booking code Q which is not eligible for the Business Extra upgrade certificate, instead you need to put the reservation on "Hold" on the AA.com site, then call American to "Upfare" (i.e. increase the fare) to an eligible booking code, and then complete the purchase online of the more expensive Economy fare that’s the correct booking code to upgrade. You can only upgrade one class, so if you have bought an Economy ticket, you can only upgrade to Business, not First class. And you can only upgrade one segment, meaning if you have an itinerary that's San Francisco to Sydney via LA, you can only upgrade one of those two flight segments (hint: make sure it's the longer LA to Sydney flight). Another way to use the points is by redeeming for AAdvantage Gold Status. You can redeem this for yourself or gift it to someone in your company. It’s 3,200 Business Extra points and gives the recipient access to Main Cabin Extra seats (seats with extra legroom that you usually have to pay for) within 24 hours of departure plus the occasional upgrade. You can also use 300 points to redeem a day pass for Admirals Club. It can be used at multiple clubs on the same day. Note that these are paper awards and will be sent to you by regular US mail. 3,000 points will get you an Admirals Club membership for a year. If your company spends $50,000 on travel and a lot of it is on OneWorld airlines, you could be earning 10,000 Business Extra points. 10,000 points is 5x round-trips in Economy within the US, or it’s a First class PlanAhead round-trip ticket from the US to Australia, Brazil, Japan, China or anywhere in Europe. A free First class ticket to basically anywhere in the world is definitely worth the effort! Even if your company spends less than $50,000/year on travel, there are ways to earn more points, for example with Rocketmiles. Book a hotel and you can earn up to 500 points per night, that’s equivalent to spending $2,500 on flights for the same amount of points. Keep up to date with other Business Extra special offers here. Additionally, if you sign up for the American Express Business Extra Corporate Card, you can "triple-dip" on points. You earn rebates and points for using the credit card, Business Extra points and AAdvantage miles! However, AAdvantage miles are a better currency than Business Extra points as you earn 25x more and redeem them for the same awards that can be 10x the miles vs. points, you should consider other American Airlines credit cards. Something to keep in mind is Business Extra points expire on a rolling two-year basis. If you earned points in January 2015, they will expire on December 31, 2017. The same if you earned points in December 2015, they will expire on December 31, 2017 and their validity cannot be extended. You can book a flight using them for beyond the expiry date, and then change it later if you need to, but you must redeem the points by the expiry date. If you like the sound of a free First class ticket but don’t like the sound of doing all the work to get it, then allow me to introduce Flightfox. We have travel experts all around the world who are crazy about earning points to offset travel costs. We connect you directly to them and they’ll do all the work for you. Just sit back and relax in your free First class suite!